The first Primitive Methodist chapel here was opened in 1845 in Market Street, but was demolished for the coming of the railway shortly afterwards. 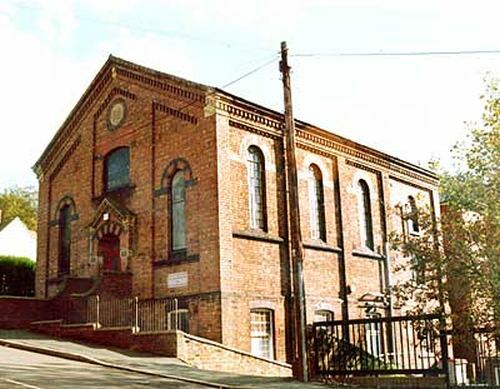 A new chapel (described as "well situated" & "fronts the street") was built in 1847 in Station Hill on land bought for �0. It was 39 ft x 36 ft and had seating for a reported 500 people. The old chapel was sold for �0, so they were able to erect a gallery in the new chapel, & they brought the pulpit and other furniture from the old chapel.They also had a house and land for a burial ground. The first service in the new chapel took place on 24th November 1847. On Census Sunday in 1851 they had 160 worshippers at their afternoon service and 261 at their evening one, as well as 148 children at the Sunday School. This chapel only lasted 20 years as it had to close due to mining subsidence. A replacement chapel (in this photograph) was built further east on Station Hill in 1868. The foundation stones were laid on the 20th April 1868. Originally square-shaped, the chapel was extended at the back by one bay in 1905.The chapel closed c.1981 & the congregation joined the United Reformed Church. Photograph © Brian Houghton 2003.